5. Sizes and styles to fit every need and budget. 4. The best way to move squirrels and other small mammals out of your way is with a blast of air! 3. Back pack blowers can give you that cool sought after “Buzz Lightyear” look! 2. The fastest way to clean a room without using a broom (just ask Bill Murray in 'Caddyshack'). 1. More moving air at your finger tips than you can find at a political convention. Pros: Great for moving leaves, grass, debris quickly; hand-held, backpack, and rolling options available. A leaf blower is a great invention. 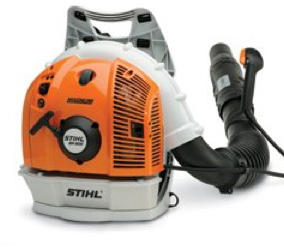 To compare leaf blowers, a good explanation of the different types of machines is needed. When you need to move grass clipping, leaves, or other light debris there is no better way to get the job done than using a stream of air. Since different jobs require different machines, a variety of leaf blowers have been developed over the years. For the really big jobs, blowers with large 4 stroke engines are mounted on a supporting frame. The blower is pushed (or pulled) along the ground, and the direction of the air flow can be directed using an outlet chute. Sometimes a blower will be used for extended periods of time, over uneven terrain where a frame mounted machine would be impractical. The backpack style blowers deliver plenty of air, with a design that lets you use it all day without getting tired. The peak of blower efficiency is the handheld blower. 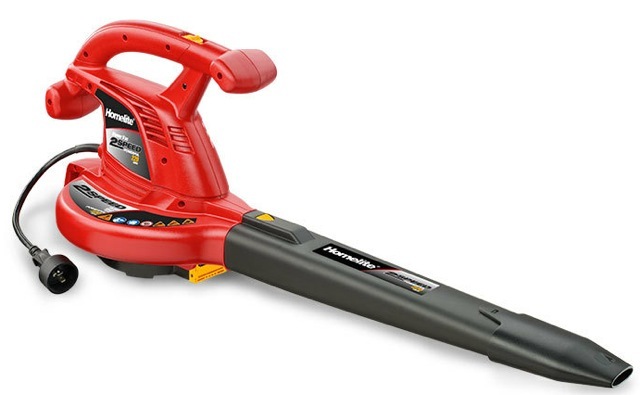 This is the most common leaf blower seen, and is a staple of the professional landscaper. 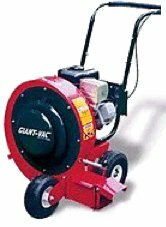 Both electric and gas powered models are available, with the gas powered machines the most popular among the pros.